It has been ages since I participated in Gail's Wildflower Wednesday. So, last week when Kevin, Bart and I went to the trails at the Royal Botanical Gardens, I was on the hunt for anything wild, petalled and ready for its close-up. Coming back with my images after this walk, I realized how out of practice I was, and why I need to participate a little more often! Just off the parking lot and into the beginning of the woods I found this pretty pink flower. Definitely from the rose family, but with flowers that are more like raspberries. As close as I can come, and I welcome correction from any and all, is Rubus odorata. And the next time I'm on the trail, if the fruit is still there, hopefully I'll be able to get a better i.d. Only 10 feet away from the first lovely flower, I found this bodacious plant. For all of you having a head shake and a giggle, yes I know, I'm probably borderline going to be banned from any further WWs. 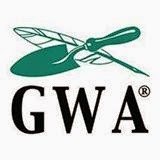 I was having trouble finding it in any of my wildflower books, so I opened my Publication 505 Ontario Weeds and there it was on page 214 of publication 505 Giant Ragweed - Ambrosia trifida. Further digging on the net showed a gal in Texas with one that was 16 feet tall, this one in contrast is about 6 feet tall. See how important participating in these great events are. Now I know what Giant Ragweed looks like, and so do you! This was tricky to find too, until I did my web search (big, yellow, daisy-like, wild), and presto - guess whose site came up? Gail's. This was one of her 2014 Wildflowers of the Month. It is Silphium perforliatum. It is growing in a damp bright area and is over my head. I always find it interesting to find big leaf plants that the bugs aren't too fussy on. A little Daucus carota, Queen Anne's Lace. The water levels seemed a bit lower considering all the rain we had had. Not sure if they've adjusted the water levels? When you leave this point, you head up a hill. I'd said to Kevin that I'd hoped to find Herons. Little did I know, I'd find 5! Long lens and silly branch in the way, but if you play Where's Waldo for a moment, you'll find all of them. At the halfway point we stopped to have a look at the waterlilies Nymphaea odorata - one of the best years ever for blossoms. More blossoms here - the much maligned, though not so much of a problem now - Lythrum salicaria and a pretty patch of white Eupatorium. Bulrushes....and lots and lots of green. On the return around the pond, I was able to see one of the parent Blue Herons - until I Googled, I had no idea that the immature birds were white. Close to the ground Prunella vulgaris. And then, (theme song from Jaws) the most dreaded late summer-Canadian moment. That Primal Scream Time when you see your first leaf changing and you realize that Summer really is on the way out, and those cool nights and days are fast approaching and you have to cherish every last pre-frost day. Maybe we'll be lucky and have a long stretch of great weather. The oracles at Environment Canada say we'll have warmer than normal weather up until November. And, if they're right, I'll be back, no excuses, ready for the next several months of Wildflower Wednesday. You found a lot on your walk. That is a beautiful place! 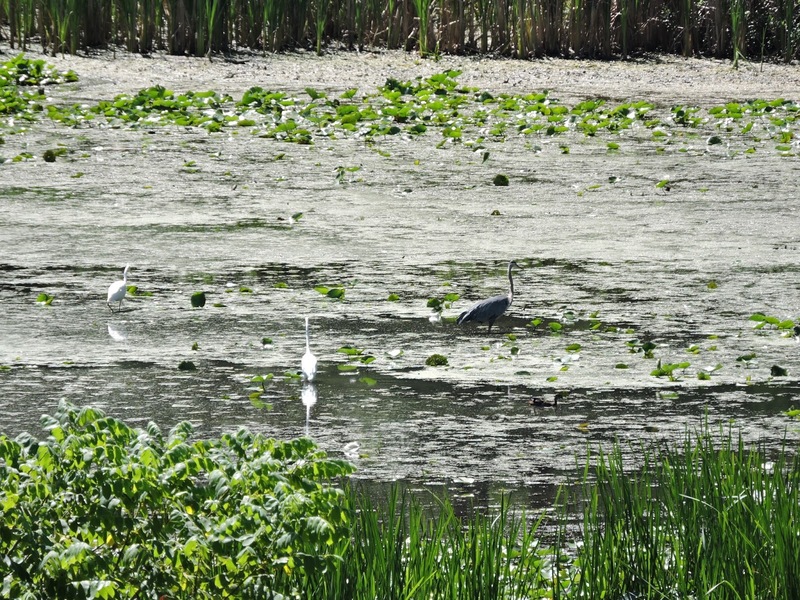 How cool to see herons like that! The leaves you showed after the yellow flowers are on a cup plant, so if the yellow blooms were on that, that's what they are, and not what you thought when you looked it up. A lot of flowers look similar to that. I love what you said on Gail's post about wildflowers doing their own thing, and not being predictable from one season to the next, or something like that. Thank you Lea and back at ya for for a happy Wildflower Wednesday! It is our favourite place Sue - after a week of work, we'll have a Sunday walk and come back completely relaxed and refreshed. And thank you for the Cup Flower i.d.! There are so many happy daisy flowers out there. I managed to find the right botanical name, but not the common one. When I go past it through the fall and winter (great seeds), I'm going to think of it as Sue's cup flower. Wow, that's a stunningly beautiful place. It reminds me of Wisconsin. :) The wildflowers you mention are common ones here, too. Hope you had a happy WW! What a lovely place to walk! The water lilies are beautiful, and the Lythrum and Eupatorium really provide a nice combo. I enjoyed seeing the herons--that's something I definitely don't see around here; I do have red-bellied woodpeckers, however, especially in the winter time. 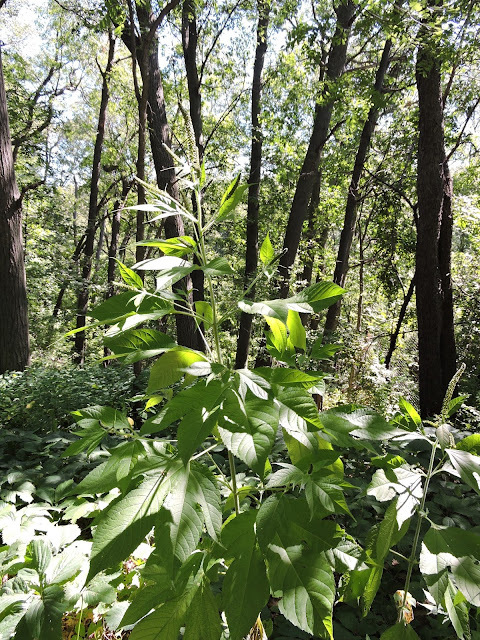 Don't feel bad about not recognizing the giant ragweed; I've admired many an unfamiliar plant until I realized it was a noxious weed:) It's always fun to "visit" different places on WW--enjoyed your blog! I have been seeing from 4 to 14 monarchs at a time the last couple of weeks. I don't remember how many I have seen other years, because my memory is not good. I'll have to check last year's blog posts to see if I said how many I had been seeing. The reason I know what the long-horned bee is, is because Heather Holm let me know on Facebook. I still would like to be able to tell what the different sized bumble bees are that I see. We were already paying $2.00 a month for photo storage, while the email said I was on a free plan. I need to check the new gmail Larry set up to see if they've replied to his email. That's very kind of you Sue! Seems that there's a better population in your area of North America than here. My next big monarch draw - a Seven Son Plant - Heptacodium mecanoides is on the verge of blooming - it will be the test to see how our population has done. Good luck with Google! Rose - here I had imagined a lovely pink or purple plume, like Veronicastrum....it really is a great exercise to hunt down to find out exactly what the plant is - offensive, or not! Enjoyed the walk - what a lovely woodpecker! Such a wonderful series of photos! I just planted a couple of the Flowering Raspberry this year. They haven't done much yet but I have high hopes for next season. I wondered the same thing about the Red Bellied Woodpeckers. I actually thought they should be called Red-Necked Woodpeckers. However, it turns out they do have a small red mark on their bellies. Actually, with today's heat and humidity, I find myself thinking fondly of cooler weather, leaf changes and all! 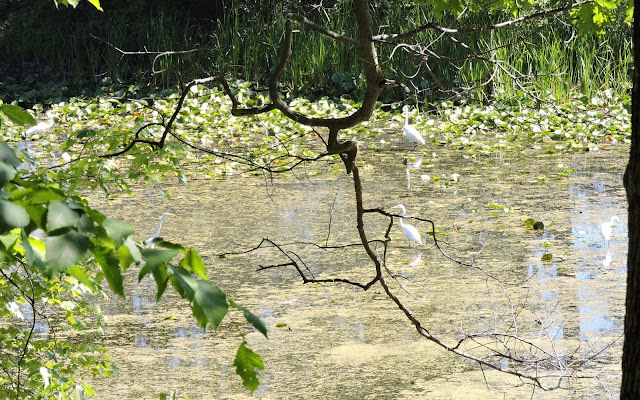 I had no idea the juvenile herons were white either. Cool! How are you fairing in this heat? We had two weeks vacation at this unfortunate time. Boy were we sweating while working on our various projects around the house! A friend has the first plant in her garden. 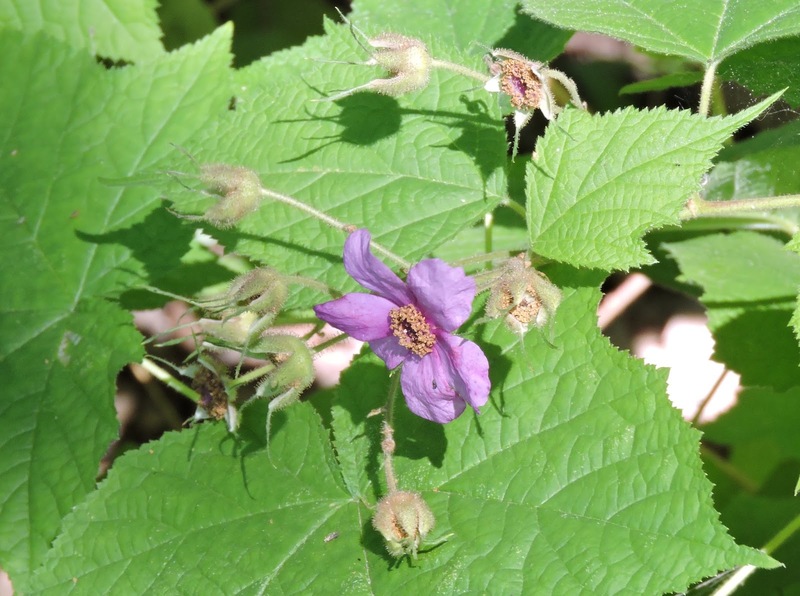 It's common name is wild raspberry and apparently the fruit is edible. It spreads rather aggressively I've heard. I have the third plant in my garden. I swear it is about 12' tall. It has flopped sadly, as it likes moist conditions and sun. Lord knows we have had sun, but not a drop of rain for almost two weeks. Thank God for yesterday and today's rain. The leaves give it the name 'Cup Plant'. Water collects in the leaf cup and birds and insects like it. See you went to Buffalo. Looks like a great tour! Jennifer, me and the garden, not so well in the heat and seasonal transition. Buffalo was great - so many gardens, just not enough time! Helen, today's weather has been a treat - thank goodness for the cool. I'm really over the summer weather - if I can't plant beans, don't tease me. Jason, the naming of birds is confounding sometimes....I suppose if we could insist on Latin names, but remember now that a Robin is called Turdus migratorius....so maybe not I guess. Looking forward to saying hello tomorrow to you all Diana, Beth, Hawkeye & NC Sue!